The Vertical Charger Mount (VCM) attaches securely to a charger stand or racking to accommodate chargers that more typically mount to walls. This allows greater freedom of location for battery chargers, and is particularly useful in park and charge applications. Choose between two Vertical Charger Mount models: The VCM-1 supports a single charger, while the VCM-2 holds two chargers firmly within a single unit. 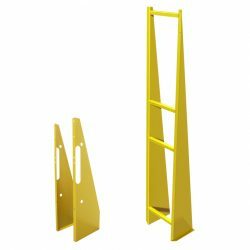 They both feature the same combination of steel and powder-coat finish that makes them ideal for the environment of the forklift battery room. The VCM is only one of the solutions BHS provides for storing wall-mount battery chargers. Freestanding units, Vertical Charger Stands, provide placement for chargers anywhere in the facility. The VCM is the best choice for attaching charging equipment directly to racks. When you need to place chargers away from racking, choose Vertical Charger Stands instead. Contact our sales team at +1 314 423 2075 to learn more about Battery and Charger Stands or to find a local dealer.